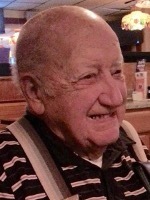 McKOWNVILLE – James J. Barber, 90, of McKownville, passed away on Wednesday, December 10, 2014. James was born in Albany, the son of the late Charles N. and Mary F. McDonald Barber. He served in the U.S. Army during World War II, and was a 1950 graduate of Siena College. He was a school teacher at Philip Schuyler High School for several years, and then was employed by the New York State Dept. of Public Works, later Office of General Services, for over 30 years. He continued to serve as a substitute teacher in the Colonie Schools for many years. After retiring, he and his wife moved to North Hudson, where he served as town assessor for nearly 20 years. James was a life member of the McKownville Fire Department, and the North Hudson Fire Department, and also served as an ambulance driver for the Western Turnpike Rescue Squad for several years. James was predeceased by his wife of 56 years, Eunice Casavoy Barber, in 2007. He is survived by his children Kathy McLean (Allen) of McKownville, Patty Barber of Loudonville, Michael J. Barber of McKownville, Judy Powers (Stuart) of Schenectady, John Barber (Terry Benoit) of Preston Hollow, and Karen Murray (Jeffrey Phillips) of Fultonville; his sisters in law Helen Barber of Colonie and Bonnie Card of North Hudson; and by twelve grandchildren, twenty three great grandchildren, and four great great grandchildren. Funeral services will be held in the Hans Funeral Home, 1088 Western Ave., Albany, Saturday morning at 8:15, and from there to All Saints Catholic Church, Homestead St., Albany at 9:00am. Relatives and friends are invited, and may call at the funeral home Friday from 4-7 p.m. In addition, a Memorial Mass will be held on Saturday, January 3, 2015, at 10:00am in Our Lady of Lourdes Church, 1114 U.S. Route 9, Schroon Lake, NY, and relatives and friends are invited to attend. Interment will be held privately at a later date in Calvary Cemetery, Glenmont. In lieu of flowers, memorial contributions may be made to the McKownville Fire Department, 1250 Western Ave., Albany, NY 12203; or to the North Hudson Fire Department, 3034 U.S. Route 9, North Hudson, NY 12855. To leave a message of condolence for the family or obtain directions to the funeral home, please visit www.HansFuneralHome.com. Click here to view James’ resting place in Calvary Cemetery, 481 Route 9W, Glenmont, NY 12077. I am so sorry to hear of the loss of your dad. Prayers from the Novotny Family coming your way. Rest eternal grant unto him, O Lord, and may light perpetual shine upon him. Amen. Our thoughts and prayers are with you Judy, Andrea, Erica, Bob and your families. So sorry for your loss. Thoughts are with you and your family.